Prayer is a very important weapon to have in your arsenal. Prayer has a way of bringing heaven and the atmosphere of the kingdom of God to you on earth. 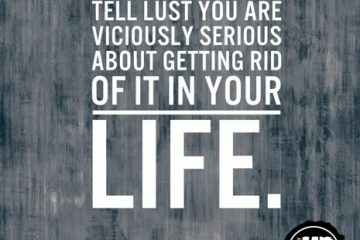 Daily prayer is important for living a lust-free life. This prayer can be easy: “Jesus, I thank you for dying so I can be lust-free today.” Often men will choose to pray throughout the day to maintain the lifestyle they want to live. God will not withhold from you anything you regularly pray for that is in His will. Living lust-free is definitely in His will. Living lust-free is the way Jesus is currently living and wants us all to live. The key to this is to pray desperately. Pray as if you need to be healed from a disease. This isn’t a place to passively come to God for restoration. Be aggressive. Pursue God for His promise of a lust-free heart and mind to become your possession. Ask and beg Him to make the changes in your heart and mind so you can truly live free from lust. Finally, ask for faith to believe that today you can have minutes, hours, and even the entire day to be lust-free. I find praying the first thing in the morning sets the tone for the day. Regardless of when you pray, pray daily to God. He loves you and wants you to be free even more than you do. 1. If you were to pray to live lust-free, what would be some key elements in that prayer? 2. If God could increase your faith, how would you want him to increase it so you could believe? 3. What time each day is best for you to pray to be lust-free? 4. Who can you be accountable to for the next thirty days to join you in praying for a lust-free life?